If you live in Cary or the surrounding area and need a trusted veterinarian to care for your pets – look no further. Dr. Meredith Highsmith is a licensed NC veterinarian, treating all types of pets. Your pets’ health and wellbeing are very important to us, and we take every possible measure to give your animals the care they deserve. 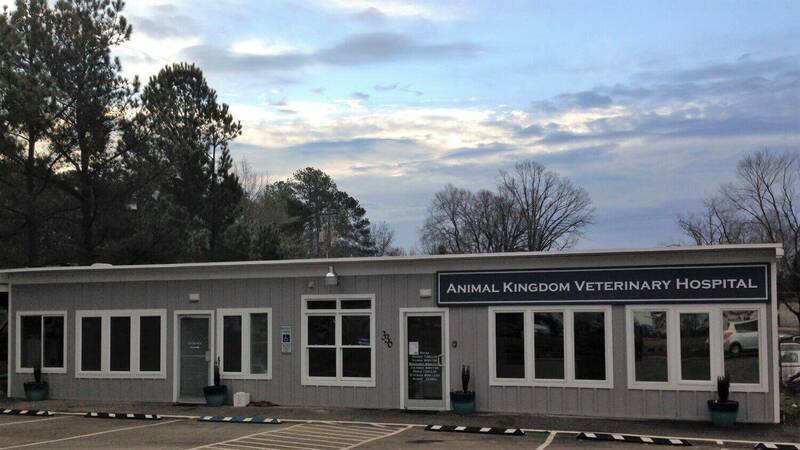 Animal Kingdom Veterinary Hospital is a full-service animal hospital and welcomes both emergency treatment cases as well as pet patients in need of routine medical, surgical, and dental care. Dr. Meredith Highsmith has years of experience treating serious conditions and offering regular pet wellness care. Beyond first-rate pet care, we make our clinic comfortable, kid-friendly, and calm, so your pet can relax in the waiting room and look forward to meeting our Cary veterinarian. We are happy to offer a number of resources that enable you to learn about how to take better care of your pets. Please feel free to browse our site, particularly the informational articles. The best veterinary care for animals is ongoing nutrition and problem prevention, so becoming knowledgeable about preventative pet care is essential to the ongoing success of your animal’s health. If you have any questions, call (919) 460-9111 or email us and we'll promptly get back to you. Our Cary veterinarian office is very easy to get to -- just check out the map below! We also welcome you to subscribe to our newsletter, which is created especially for Cary pet owners. At Animal Kingdom Veterinary Hospital, we treat your pets like the valued family members they are. Diamesha became a member of the team in February 2018. She is originally from Greenville, NC and moved to Raleigh to attend North Carolina State University. At NC State she majors in Animal Science and is a part of the class of 2019. Diamesha plans to go to vet school and become a mixed animal veterinarian. At home Diamesha has one pet currently, a Shih Tzu named Slater. In her free time she enjoys watching Animal Planet, spending time with her family, and enjoying life! Alena joined the Animal Kingdom family in 1998 when she helped to open the hospital. She is a long time resident of Cary, having moved here at the age of 13. Alena attended West Cary Middle and Cary High School before heading off to North Carolina State where she earned a B.S. in Zoology. She then chose a career as a Veterinary Technician and later joined Animal Kingdom. In her spare time she enjoys loving on her babies both furred and un-furred, gardening, reading, cooking with her daughters, spending time with her husband and the never ending task of home improvement. Alicia has been a member of the Animal Kingdom family since August of 2013. Prior to her work here, she volunteered for Noah's Landing in Coats for 8 years as a Zookeeper, Tour Guide, Camp Counselor and eventually Camp Director. Her heart is with exotic animals, especially rabbits. She has been a licensed Wildlife Rehabilitator specializing in Eastern Cottontail Rabbits for over 5 years. Together with her husband and parents they currently have 15 pets along with a varying number of wildlife at any given time. Her dogs are Hope and Wilson. Her cats are Lily, Maia and Elsie. Her rabbits are Adelina Mae, Remy, Carl, Cole and Clementine along with 3 non-releaseable wild rabbits Spinny, Blue and Quasimodo. She also has a cockatoo named Sophie. Kristen hails most recently from Seattle and is enjoying the abundance of sunshine that North Carolina offers. She joined the Animal Kingdom family in January of 2016. She is finishing up her degree in the quest for a future veterinary degree. Kristen has been in the veterinary field for over 10 years. Currently, Kristen lives with her husband David and her three cats Bear, Nigel, and Yoji. Keeping four boys in line is a full time job in itself. Her spare time is devoted to crafts like leather working, sewing, and costume construction. Her other favorite activities are camping, hiking and baking. "The staff are the most pleasant people I have ever interacted with and I wouldn't take my pet anywhere else. I have complete faith and trust in them. Congrats on your new facility! ���"
"The doctors and staff continue to tke wonderful care of Zaley. She 's always treated with love and care. Thank you!" "Love all things Animal Kingdom, staff, care, location & cost. My family of pets have been going here close to 20 yrs. Treatment is always caring and reasonable." ""I’m SO grateful for how flexible the staff is in helping me get scheduled. As a busy single mom of two, my fur—child falls to the end of the list often and Animal Kingsom makes it easy for me to get my dog I. To be seen, treated and groomed. THANK YOU!"" ""Animal Kingdom with Dr Highsmith and the entire staff are caring, knowledgeable, patient, and professional with treating our 15 year old Bengal cat Marley who has Kidney Renal Failure Health Problems . We are fortunate to have such a dedicated group of Animal Lovers watching out for our beloved cat! I highly recommend Animal Kingdom to any pet owner."" ""We love everyone at the office! Such great care with our furries!"" ""I have been coming to Animal Kingdom for years and continue to do so because of Dr.Highsmith’s expertise and easy manner."" ""The staff is always so accommodating, friendly, and genuine. I've now brought two generations of bischoodles to AKVH, and can t imagine going anywhere else. While all are great, Kristen and Alena deserve special recognition for patiently answering all my questions with a smile. Thank you!"" ""We have been bringing our pets to Animal Kingdom for over 17 years. We ve always been pleased with the excellent service and compassion toward our pets. Thanks for all you do!"" ""Been coming here for almost 20 years and I wouldn’t trust my dogs with anyone else. Dr. Highsmith and her staff are top notch and they truly care about their patients. I feel blessed to have them especially when my fur babies aren’t feeling well."" ""We are very pleased with Animal Kingdom! They love our animals as much as we do! The staff is very friendly and professional. The Vets are very knowledgeable. The staff and docs as well are very loving to the animals."" "Love them, very friendly and helpful. I will miss Jean, but glad Elaina is still there!" "This is just a TESTimonial"